Apollo 14 was the eighth manned mission in the Apollo program and the third to land on the moon. Following that moon landing, Alan Shepard, Stuart Roosa and Edgar Mitchell were in the command module “Kitty Hawk” when it splashed down on February 9, 1971. The module splashed down in the South Pacific Ocean, south of American Samoa. 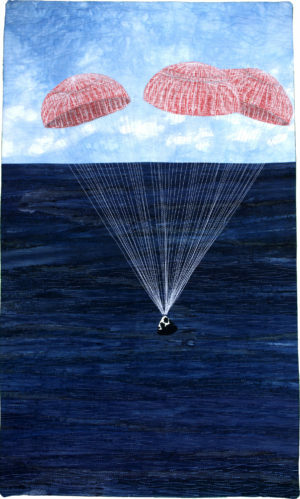 I was entranced by this image of the module floating down to the ocean by parachute. While the idea of walking on the moon or collecting moon rocks seemed almost inconceivable, this image was one we could all understand and connect to the real world. 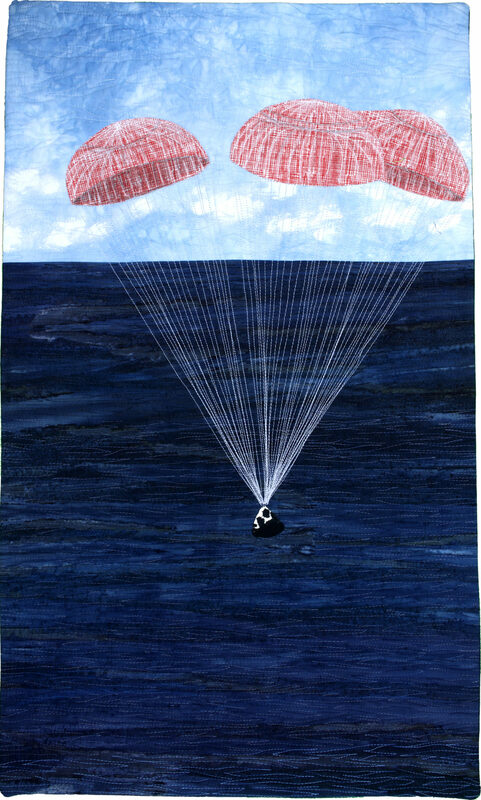 The calm descent by parachute into the blue ocean was the perfect mission ending that demonstrated that the astronauts had survived and returned to earth safely. Machine applique, machine quilting, painting. Cotton fabric, acrylic paint, color pencil, wax pastel.